With the acquisition of Interline Brands , averaging $2B in annual revenue with 7 separate multi-family and commercial business providing exclusive services for Pros, The Home Depot felt it was imperative to grow the Pro segment of its user base with a Pro website that behaves like the Home Depot they’ve come to love but also be a big proponent of adding value to the pro shopping experience. 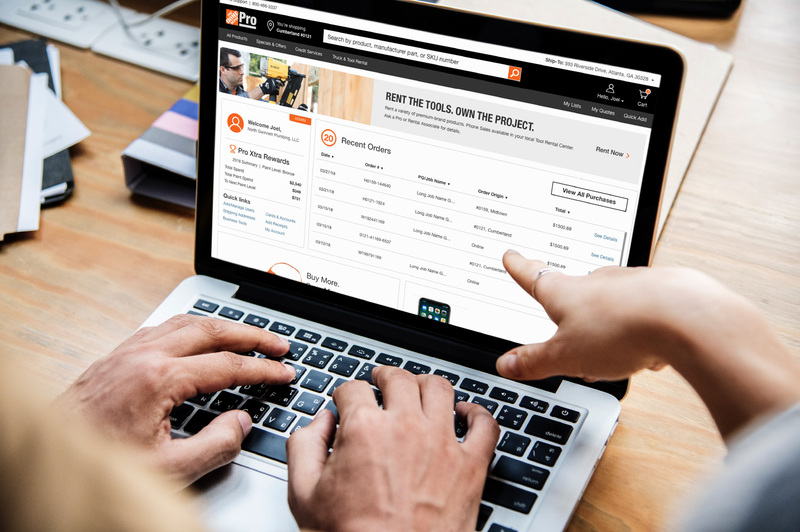 With the average Pro spending more than $6K annually it was time to focus on crafting an experience for one of The Home Depots more complex and large purchasing customer. To create a cohesive MVP experience that carries forward the HD features everyone loves and to create, test, survey and analyze Pros to come up with an experience that not only will be catered to how Pros use the website but also look forward to create enhancements that Pros would find useful when it comes to their shopping experience. Unlike the .com experience Pros find useful anything that makes their jobs easier with a frictionless experience. Little to no marketing that doesn’t speak to the Pros segmentation. To create a useful home page meant we needed to consider the Pros most common wants and needs. First we had to understand exactly what the needs of a Pro user would be for a home page. 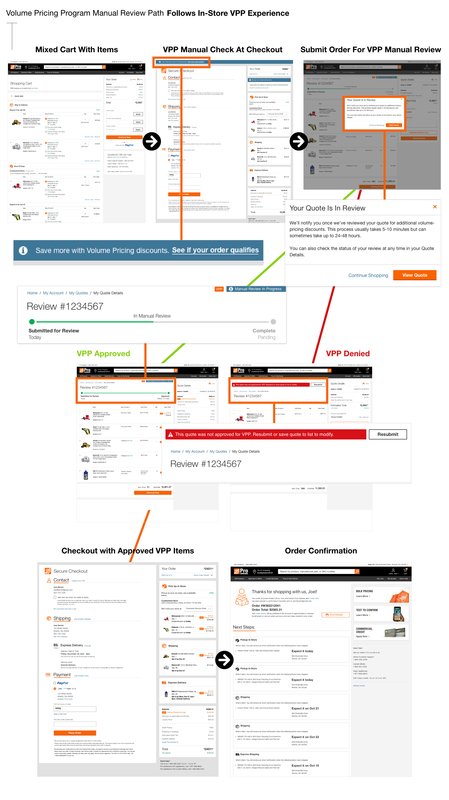 By conducting user tests usability studies, surveys along with anlytics we concluded that some of the most common tasks of Pros is reordering previously purchased items, uploading order lists for bulk ordering and tracking orders. 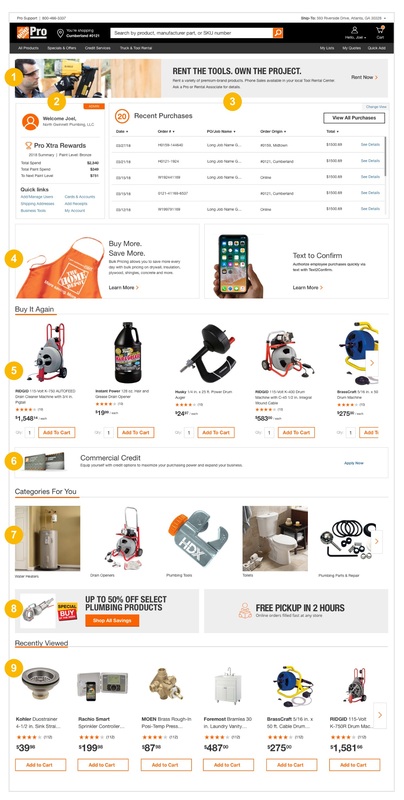 Listening and learning from Pros concluded that the most useful homepage features would be the ability to see recent orders, be able to quickly buy most commonly purchased items, and serve up browsing behaviors by way of a widgetized and module/card based experience. Easily digestable widgets. Pros don’t have much time for extensive jargon. Project stakeholders approved HP for Q4 and launched quickly to much appeasement from Pros. With our first Alpha group if Pros being implemented in the new Pro experience the HP was well received and very useful for Pros. They spoke we listened. My involvement as Senior UX Designer was to craft experiences for the top of the funnel aka Browse Experience which includes a Marketing Landing Page, Home Page/Dashboard, Product Listing Pages, Product Information Pages as well as Header and Footer. 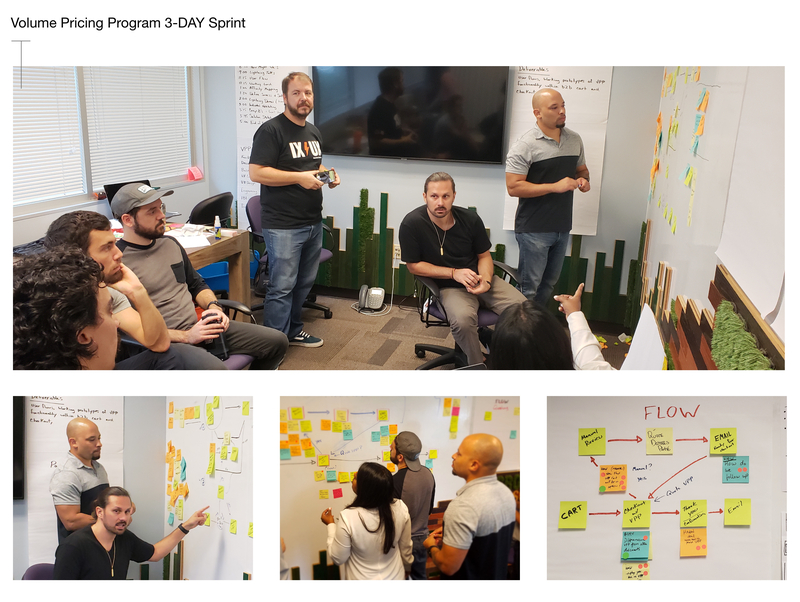 Working closely with stakeholders, researchers, data analytics, and devs, myself and team crafted a Pro MVP experience and custom homepage focused solely on the pro customers needs. Myself and team put together over 50+ comps and wires to test with Pro users. Sharing comp findings with team and creating multiple iteration after iteration we began to really hone into a Pro focused experience. the process was long and extensive and we learned so much about the Pros shopping needs along the way. Account quick details were a hit to Pros. Finding quick account details along with most commonly used links really hit a home run during our testing. You’ll be surprised at how many Pros know the exact item number for various products. Being able to upload an itemized spreadsheet and/or input item numbers to add to cart was imperative to Pros. Pros shop frequently from lists and Pros found this area very useful since they quickly create lists to pick and buy from for later use. Most commonly purchased items seemed to really resonate with Pros since they frequently buy items they have a history of purchasing. Serving up the Buy It Again Module and Quick Links still tested well no matter what comp we showed Pros. This tested well so its a no-brainer that we included this in the final homepage. If it isn’t easy to read for Pros on first glance then most of the time its not useful. Showing them charts and graphs on such a small scale didn’t test well at all and received the most negative feedback. Showing recent orders in such a small module didn’t test well with Pros. The most common behavior was passing over this module and little to no interaction. While quotes is useful the UI for this quote module failed testing. Pros needed more details and less UI around their open quotes. Pros failed to interact with the tabbed view module and quickly passed up this entire area. Many didn’t even realize the tabs were clickable and just scrolled pass this area. Not surprisingly but Pros loathed this resource area sighting that “I’m a Pro why would I need to research how to do my job?!”. A quick glance at account health, quick links and information. A quick glance at Pros recent purchases for easy access to track orders. Pros use lists frequently to group projects. This module is an option for the Pro that wishes to have access to Lists. Pros most common buying patterns are purchasing previously bought items. This module serves up previously purchased items. Instead of basic consumer marketing each Pro has assigned segmented marketing that speaks directly to their market. Pros account credit card benefit banner. Showing useful categories that the Pro most commonly visits. A Pro not only frequently buys previously bought items but they also view products and need a quick reference to what they’ve already viewed. After months of work we on-boarded 60,000 Pro Users to our MVP Pro experience with plans of importing many more users in the coming months. With a roadmap of various homepage enhancements and features the road to a more customized Pro experience is in sight. 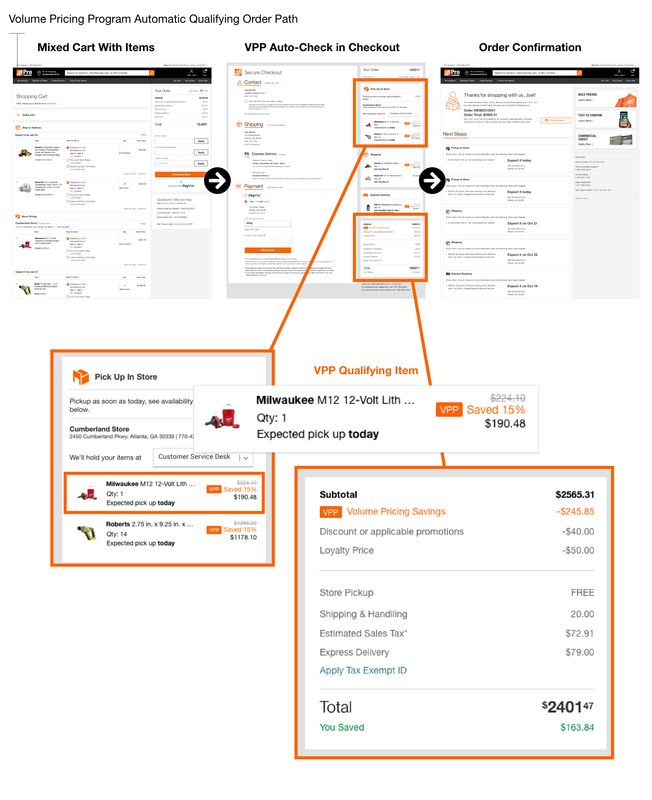 How Might We integrate the in-store feature Volume Pricing Program (VPP) into the online experience for our Pro customers so that our Pro’s can begin to enjoy consistent special savings both in-store and online? 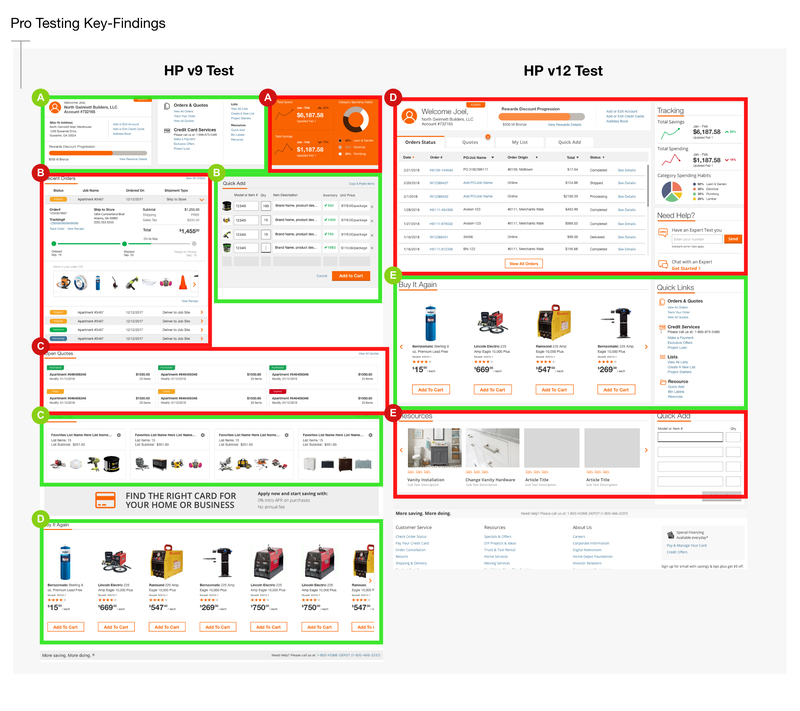 Perform a thorough competitive analysis in the B2B volume discount space and through our findings and interviews, define VPP functionality for the THD.com Pro customer. Through this we expect to see an increase in engagement and online revenue from our Pro customer base, while also helping to reduce lines at the Pro Desk and improve customer experience. To work closely with the team of researchers, Pro Account Reps, content marketing and Pros to craft a intuitive experience focused on Volume Pricing Program improvements and the adaptation to moving the whole process online. Keeping it simple. A easy hands-free check in checkout. If your order qualifies you’ll see the VPP discount. If it doesn’t you have the option to submit your order to be reviewed for the VPP discount. VPP is a discount that pro customers are aware of but are not sure how they get it. By showing the discount on the Checkout page with badging and % saved, the customer is pleased to see what savings were applied at the item level and believes “this adds value to the program”. Coming up with an automatic review ie happy path was reviewed by stakeholders and pros by conducting usability tests around the entire process. The consensus was that pros understood the process and were ecstatic that they no longer had to go to the stores pro desk to qualify and/or submit an order for vpp review. Coming up with an manual review path was reviewed by stakeholders and pros by conducting usability tests around the entire process. The consensus was that pros understood the process since it closely followed the in-store experience. 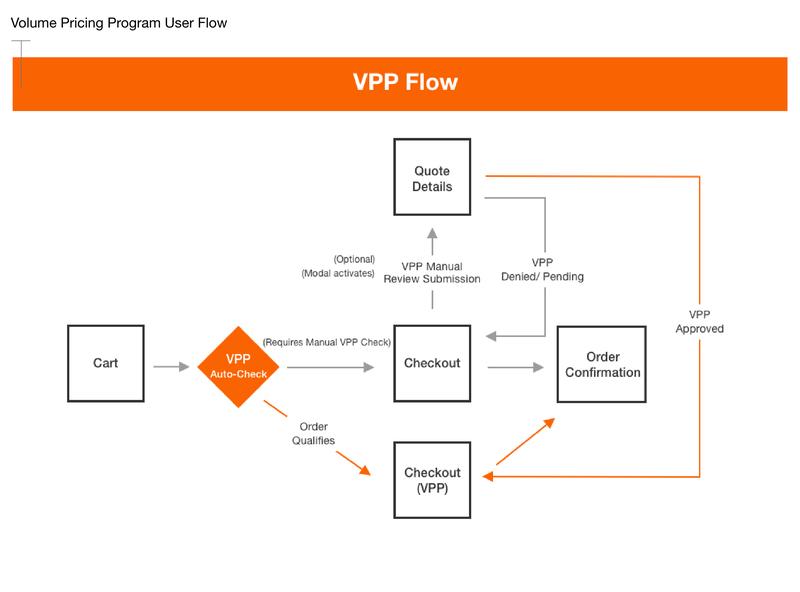 By implementing this feature it’s projected that this process will free up VPP manual review processes and in store reviews by 70% and thus freeing up 10M annually and thousands of associate hours required to facilitate and sustain the process as it stands now.